The mixers can be implemented as the single balanced and double balanced topologies. Figure below shows the implementation of the single balanced mixer. In this type of topology the RF signal coming from LNA is directly applied to the input of the transistor M3. 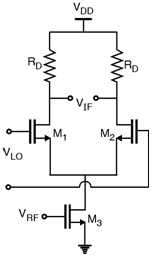 The local oscillator signal is applied at the inputs of the differential pair transistors M1 and M2. The IF (Intermediate Frequency) signal is available at the output. In this topology the local oscillator drive voltage directly affects the conversion gain and the noise in the circuit.